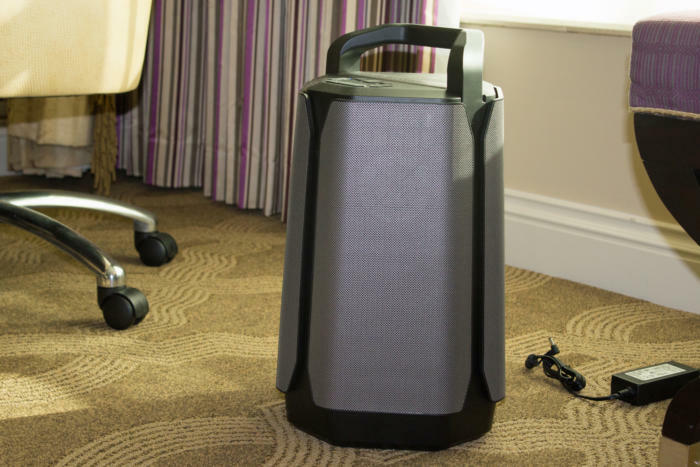 I see dozens of Bluetooth speakers at CES every year, but it’s been a long time since I’ve seen anything as big or as powerful as Soundcast’s VG7 outdoor speaker. 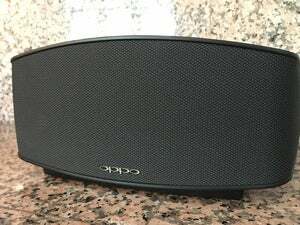 In fact, the last time I was so impressed with a self-powered outdoor speaker was when I heard SoundCast’s very first offering, the OutCast. The company has been relatively quiet after being acquired by a private equity group in 2015, but I was impressed with its new VG1 handheld speaker and was looking forward to seeing what else the company was working on. It turns out the VG1 has a bunch of bigger siblings, with the VG7 coming up next. Soundcast isn’t exhibiting on the noisy show floor, they’re showing their wares in one of the high-end home audio suites at the Venetian. The company showed me an early prototype of its outdoor (water- and weatherproof) VG3 and VG5 speakers, and a working model of the larger VG7. All three models will support Bluetooth 4.2, NFC smartphone pairing, aptX and AAC codecs, and Qualcomm’s True Wireless Stereo so that you can pair two identical speakers and operate them as a left/right stereo pair. The VG3, VG5, and VG7 have capacitive touch controls on top for play/pause, volume, and mute functions. The larger VGX speakers will also join DTS’s Play-Fi multi-room audio ecosystem. From left to right; Soundcast's VG1 (already on the market), VG3, and VG5 self-powered outdoor Bluetooth speakers. The 9.0-inch-tall VG3 has a columnar form factor with a 3.0-inch down-firing woofer at the bottom and a pair of 1.5-inch full-range aluminum-cone drivers on either side. These three drivers are bi-amplified, with 20 watts RMS going to the sub and 10 to the full-range drivers. Most speakers of this size get by with passive radiators and still deliver a satisfying amount of bass, so I can’t wait to hear what the VG3 can do. Soundcast expects to ship the speaker in the May/June time frame, when it will be priced at $299. I didn’t get a spec sheet for the VG5, but Soundcast told me they expect that speaker to be available for $499 toward the end of June. The $799 VG7 is the furthest along in development and is slated for two more rounds of acoustic tuning before it ships in March/April. The taller speaker has four, 3.0-inch, full-range aluminum cone drivers in a 360-degree array, with each driver isolated in its own enclosure inside the columnar case. These are supplemented by a 7.0-inch long-throw down-firing subwoofer at the bottom of the unit. One Class D amplifier sends 15 watts RMS x 2 to the full-range drivers, while a second independent Class D amp directs 30 watts RMS to the sub. 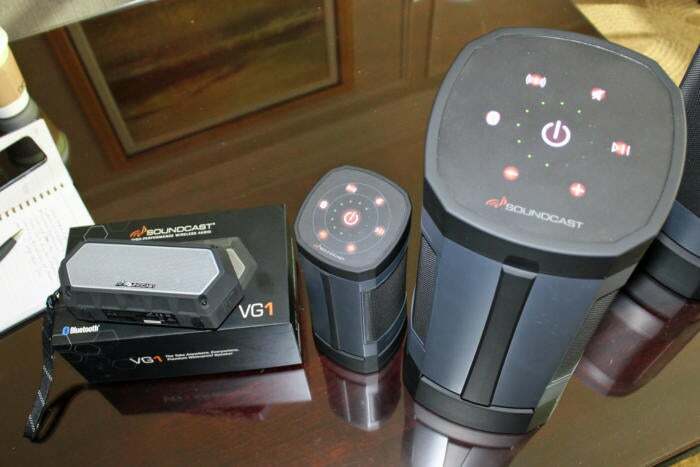 Soundcast VGX series speakers (except for the smaller VG1) will have capacitive touch controls. Although it’s smaller than the old OutCast, the VG7 sounded much larger to my ears, with superb highs and mids and chest-thumping bass. I couldn’t help but smile when I heard it. And when I heard two playing in stereo, they really knocked my socks off. You can bet we’ll have an in-depth review of the VG7 as soon as Soundcast can send one our way.